In the Spring and Autumn Period (770-476 BC), the famous strategist Sun Wu known as Sun Zi came to see the King of the State of Wu, bringing along his great work The Art of War. He offered to help turn the State of Wu into a more powerful kingdom by training a strong army for it. The king was not quite convinced and asked, "Can you try your method out on a small army?" "Can you try them out on some women?" Now, Sun Wu asked these women, "do you know how to march forward, backward, to the left and to the right?" "Yes, we do." They replied. In spite of this, Sun Wu explained to them in great detail now to march in the four directions. He also told them time and again that they must obey orders and explained why. 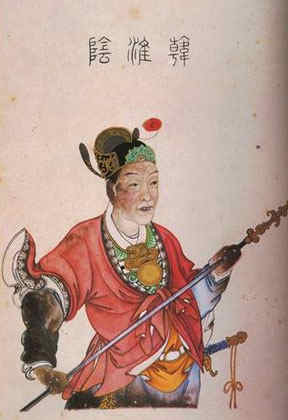 Now, Sun Wu beat the drum and ordered the army to march to the right. To his disappointment, the young ladies who had never received military training before did not act as he had ordered but giggled. Sun Wu did not blame them but said in all seriousness: "It's the general's fault if he hasn't made himself clear." He then repeated several times what he had said a moment before. Now, he beat the drum and gave an order to march to the left. The ladies giggled instead of taking his order. This time, Sun Wu said seriously: "Now the order has been made clear, so that's the leaders' faults not to obey that!" He ordered to behead the two leaders. The king who was watching the training all the time was shocked and immediately sent someone to plead for mercy for his two concubines. But Sun Wu rejected the pleading. On his insistence, the two-team leaders were executed. Sun Wu appointed two new team leaders and went on with the training. Everybody turned very serious and acted correctly to Sun's orders, just like soldiers. 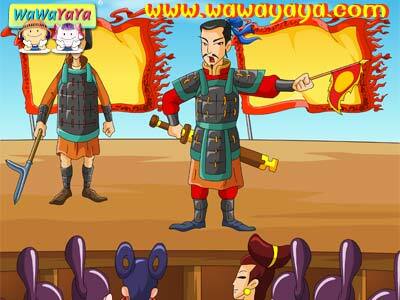 From how Sun Wu repeated his orders comes the idiom "Repeating an order time and again" . 106 To play the lute to a cow. 105 Aping the beauty’s frown. 104 The Host of The East. 101 Perfectly Fair and Impartial. 97 has eight decalitres of talent. 96 No ventured, no gain. 95 Ignorance of The Objective World. 94 The disease has attacked the vitals. 93 To build a cart behind closed doors. 87 Passing Off Fish Eyes as Pearls.